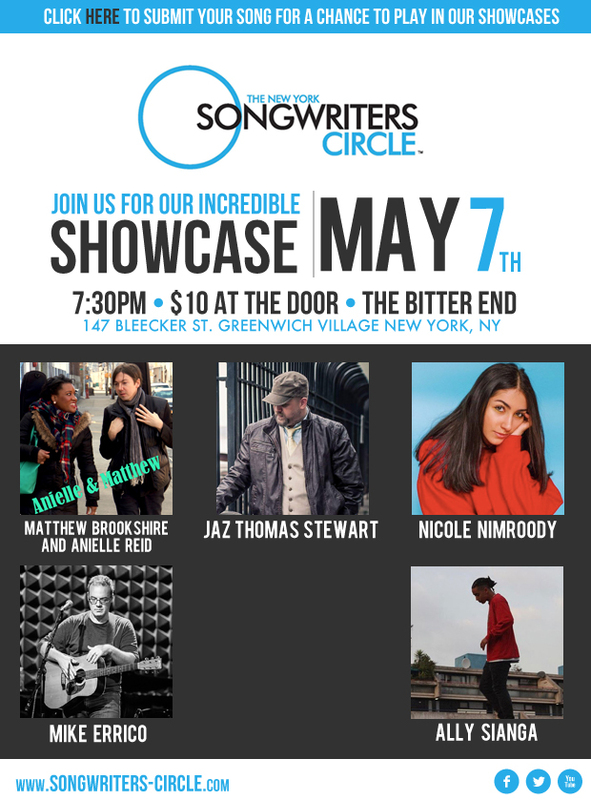 Join us Monday May 7th for our award winning singer songwriter showcase! Nicole Nimroody – is a 17 year old singer-songwriter based in New York City. Going by the artist name “Nic Nim,” Nicole writes, produces, and performs original music inspired by many genres, such as alt-rock, pop and some hints of rnb/soul. Her latest single “Silver” was just released and can be bought on iTunes and found on all streaming services. 2. Ally Macdonald – Hailing from London, UK, Ally Sianga combines poetic verses with lustful chords and melodies to creating deeply emotive blues-inspired music. His combination of smoothly delivered raps and crooning, confessional vocal performances gives him a unique and rare identity. Through his emotional songs and honest storytelling. He is most comfortable in his own skin when writing, singing and playing music. He’s also excited to be here for his 3rd songwriters circle. 4. Anielle Reid and Matthew Brookshire Acoustic duo Anielle Reid and Matthew Brookshire perform original Americana-Pop. Backed by banjo and guitar, these singer-songwriters with Southern roots bring gorgeous harmonies to finely crafted portraits of big city life. Recent live performances include WNYC’s Greene Space, the American Folk Art Museum, and a TED talk.